When Hurricane Irma plowed into Florida’s southwestern coast as a powerful Category 4 storm last month, it tore up seagrass beds, stripped mangrove forests of their leaves, and overall, left what looked like a trail of ecological apocalypse in its wake. But it’s now been a few weeks since the storm, and as scientists go out and assess the damage to the South Florida’s ecosystems, they’re starting to notice some bright spots. After doing an aerial flyover of Florida Bay after the storm and spotting enormous racks of dead seagrass, Everglades Foundation wetland ecologist Steve Davis was worried. The scene reminded him of a seagrass dieoff that occurred in the summer of 2015, when the bay—a shallow estuary bounded by the Everglades wetlands to the north and Keys to the south—became too salty, owing to high temperatures and a dearth of rainfall. The dieoff precipitated enormous algae blooms, triggering fish kills and dealing a major blow to Florida’s commercial and recreational fishing economies. But when Davis went out on the bay with some fishing guides and a handful of reporters last week, what he saw was quite different. “We did see some large floating matts of grass, like we saw a few weeks prior in overflight,” he said. But, rather than creating a vast dead-zone, all that detritus appears to have triggered a feasting frenzy. “So this is one of the positive benefits—a huge slug of organic matter is providing a food source for recreationally-important species,” he added. While it’s still early days for assessing Florida Bay’s recovery, Davis’ observations paint a different picture from the 2015 seagrass dieoff, when vast meadows of turtle grass that form the foundation of the ecosystem were completely scoured. What Hurricane Irma did, he thinks, was more akin to someone weeding a garden than bulldozing it. “After hurricanes, we [typically] see huge amounts of seagrass piled up on beaches, but when we go looking for the source, we don’t see large areas denuded,” Jim Fourqurean, a seagrass ecologist and professor at Florida International University, told Earther. Instead, ecologists see thinning of the seagrass beds, which is far less destructive. Fourqurean added that scientific surveys of the bay are just starting up this week. “In a month, we’ll be able to give a good estimate of thinning,” he said. While there are likely to be localized regions of severe damage, Fourqurean says that overall, Florida Bay might emerge stronger as a result of the storm, owing to Irma’s effects on water quality. The bay exchanges very little water with the surrounding ocean, and it also doesn’t get nearly as much freshwater from the Everglades’ wetlands as it did in the days before human settlement. But during the lead-up to Irma, a huge amount of water was sucked out of the bay, only to be replenished with fresh seawater when the storm plowed back in. It’s a bit like someone just refreshed a 850-square-mile aquarium tank. “My major professor always said what Florida Bay really needed to be healthy was a good hurricane once in a while to blow all the accumulated organic matter out of the bay,” Fourqurean said. “If that hypothesis were true, the bay should be better off next year,” except for any areas where the seagrass was totally scoured. Davis added that the storm’s rainfall led to significant freshwater recharge in the Everglades wetlands and further north, all the way up to Lake Okeechobee and the Kissimmee Valley. “It brought us a lot of water and that runoff is still playing out today,” he said. This could be a boon not only for the bay, but for the freshwater-starved wetlands north of it. Of course, ecologists are still worried about some of the other impacts Irma might have had on Everglades ecosystems, including the severely-defoliated mangrove forests on Florida’s southwest coast, and the freshwater-adapted marshes that saw a significant pulse of saltwater from the storm’s surge. 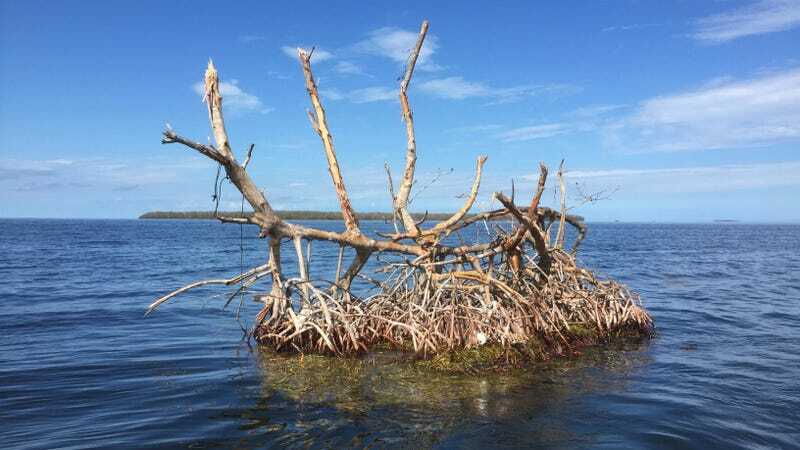 According to Evelyn Gaiser, principal investigator for the Florida Coastal Everglades Long Term Ecological Research Program, while Hurricane Wilma (2005) brought in sediment that helped build up the mangrove forests’s soils, Irma might have done the opposite. “We’re wondering whether or not that huge drawing out of water followed by a big surge [during Irma] might have redistributed that material that had been so helpful [to the mangrove forests] from Wilma,” Gaiser told Earther. As for the sawgrass marshes further inland, she’s concerned that Irma “may have brought a lot of salty water into places that are crossing tipping points toward collapse,” due to freshwater starvation. Gaiser and her colleagues are writing a proposal to the National Science Foundation for funds that would allow them to better study Irma’s impacts, and they’re conducting additional survey work this week. Irma was clearly a disaster for South Florida. It cut out power for millions, wrecked homes, trigged a horrific sewage crisis, and caused an estimated $19.4 billion in wind damage alone. Many communities will be dealing with the storm’s impacts for a long time. Parts of the Everglades could also take years to recover. Still, it’s important to remember that resilience does exist, both in the people affected by this devastating hurricane season and, as Davis and others are now seeing, the ecosystems. The question is how the Everglades will fare in a future where human caused climate change makes everything harder. The answer will depend on how well we take care of it.